Much to the delight of his fans and film lovers Selvaraghavan is back at work. Selva has resumed his long awaited film 'Idhu Malai Nerathu Mayakkam. The shooting of the film which was earlier shot for 14 days and then held back again kicked off today in Chennai. 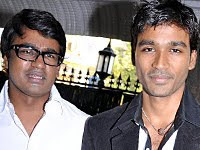 According to sources the unexpected surprise is out of a spur of the moment decision taken by Selvaraghavan. He was to do Rana Daggubati's bilingual film and the film was dropped all of a sudden. Not wasting any time Selva took the spot decision to revive 'IMNM'. 'Idhu Malai Nerathu Mayakkam', a para-thriller with the trade marks of Selva, revolves around a couple, who have their own shadowy, buried secrets. Dhanush and Andrea play the mysterious couple in the film. Dhanush is also equally delighted and said doing a Selva film is like going back to school to learn the fundamentals all over again. 'IMNM' is Selva's eighth film and his fourth with Dhanush. This time Selvaraghavan takes no chances and hasn't revealed much about the new film. The film is produced by Selvaraghavan's father Kasturi Raja under the banner of RK Productions Pvt. Ltd.
G.V. Prakash is scoring the music and Ramji handles cinematography.